With less than two months to go to Spain’s general elections, the May 15 (15-M) Movement is highlighting the serious problems caused by the financial crisis in the rich world, on the premise that democracy is not just about voting every four years, but an open system in which citizens can and should participate directly in public affairs. 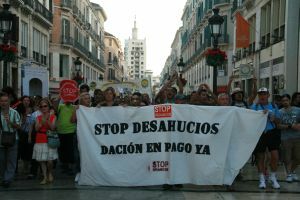 The economic crisis has left four million Spaniards unemployed, more than 20 percent of the economically active population, most of them young people, while thousands of families cannot keep up their mortgage payments and have lost their homes. “The time has come for democracy to go beyond political representation, and open up to consultations and referendums for matters of social importance,” Klaudia Álvarez, a 35-year-old spokeswoman for “Real Democracy Now” (DRY), the platform that convened the original protest at the Puerta del Sol in Madrid on May 15, told IPS. That day gave its name to the 15-M movement of demonstrators who call themselves the “indignados” or “indignant” or “angry” ones, which has spread to other major cities in Spain. The “indignados” organise themselves through social networking sites like Facebook and Twitter and demonstrate spontaneously against an economic model they perceive as socially unjust, and a political system in which governing parties are subordinated to economic power. “Citizens should be able to propose laws, use electronic means of voting as proposed by Democracy 4.0, or help write a constitution, like Iceland’s Wikiconstitution,” Álvarez said. Democracy 4.0 is an initiative of Spanish lawyer Juan Ignacio Moreno that proposes direct voting by citizens via the internet on any matters debated in either house of parliament. In Málaga, one of the biggest cities in the southern region of Andalusia, 15-M activists were able to get the regional parliament to receive a people’s legislative initiative (ILP) presented May 31, to increase citizen participation in political decision-making, lawyer José Cosín told IPS. The campaign for the Nov. 20 elections officially began Sept. 26, and according to the polls the centre-right People’s Party (PP) is likely to win with a considerable lead over the governing Spanish Socialist Workers’ Party (PSOE). The PP won the May 22 local and regional elections – which were already marked by 15-M protests – by a broad margin. According to a study by the state Centre for Sociological Research (CIS), over 20 percent of voters said the demonstrations had influenced their voting decisions. Earlier polls found nearly 80 percent of respondents agreed with the demands of the “indignados”. This shows the “enormous” distrust ordinary citizens have of the leaders of the big parties, said Álvarez, who teaches audiovisual arts in the northeastern city of Barcelona. The 15-M movement has called for a “global non-violent protest” on Oct. 15, when “people from all over the world will take to the streets and squares to claim their rights and demand a true democracy,” according to its web site at www.15october.net. 15-M regards “the electoral process as an empty ritual, just a simulacrum of real political participation,” said Fernando Vallespín, a professor of political science at the Autonomous University of Madrid, in an interview published in September in the Spanish magazine Claves. The pressure from the movement has influenced debate in political parties, which have incorporated some of its demands into their programmes. “Many of the demands and proposals voiced by the ‘indignados’ over the past few months are already in the political arena and have been taken up by several parties, and by important sectors within the parties,” Gándara said. The government of socialist Prime Minister José Luis Rodríguez Zapatero made a political U-turn in May 2010 under pressure from the European Union, to curb growing debt and ward off a financial bailout by the country’s eurozone partners. The drastic adjustment was a fiscal success, but at the cost of deep cuts in social spending and a sharp rise in unemployment. “Spain’s politicians do not govern for the people, but in response to pressure from bodies such as the International Monetary Fund (IMF) or the European Central Bank (ECB), to keep countries like the United States or Germany happy, or to calm the panic attacks of foreign investors,” Gándara complained. With slogans like “Spend the military budget on schools and hospitals,” hundreds of “indignados” hit the streets in dozens of cities Sept. 18 to protest the cuts in public service budgets. Álvarez said DRY is preparing what is known as a Citizen Bailout that “breaks away from the absurd belief that the only way out of the crisis is to follow the dictates of austerity, spending cuts and privatisation,” and proposes alternatives such as reforming the tax system, regulating speculation and fighting fraud and tax havens. “It’s a package of constructive proposals that we hope will encourage citizens to continue to demand essential changes in our democracy,” said Gándara. “After the elections, whoever is in government, we will continue to fight for every one of our demands,” Álvarez said.